The moon is earth’s constant companion, affecting the oceans’ tides, our moods, animals, and maybe even our superstitions. Thanks to the sun, we’re able to see this celestial body as it orbits the earth . . . but not all the time. We have periods when the moon in fully illuminated, partially illuminated, and not visible at all, depending on the stage of its cycle around the earth. These stages are called phases and we have four main phases. Do you know them? New Moon - We have a new moon when its dark, unlit side is facing the earth. It is not visible. Waxing Moon - The moon is waxing when more of its surface area is progressively becoming illuminated and visible. Full Moon - The moon's lit side is facing the earth and appears to be completely illuminated. Waning Moon - The opposite action of a waxing moon. The illumination of its surface is progressively decreasing. 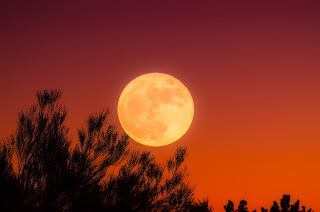 A full moon gets the most publicity because its appearance at night is certainly dramatic, romantic, and inspiring. Ancient civilizations attribute behaviors of the weather, plants, or animals to the influence of a full moon so some months have a specific name for their full moon, such has September’s harvest moon (pictured above).